Nosey Neighbors | 365 Things That Annoy Me! 365 Things That Annoy Me! I live in an apartment building, with three apartments that open out into our common hallway. The neighbor across the hall has built an extension into his laundry terrace, and has windowed it in (the hallway is actually an outdoor walkway). Every time I pass by their window, I notice that they look at me and watch what I’m doing. They are constantly staring out the window at me when I walk by. Sometimes I fumble with my keys, or I have bags from the store….they continue to watch what I’m doing until I get into my apartment. I have actually taken to staring back at them, but this is not a deterrent, they just keep watching. 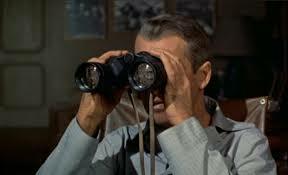 Television, movies, print and music have all made fun of the nosey, spying neighbors. I used to tease my parents and my brother when they would rush to the window when something was going on outside, but I have never really been the victim of the nosey, spying neighbor until now. Bewitched had its Gladys Kravitz and Home Improvement had its Wilson, but they were lovable kooks that we loved to watch, right? They weren’t annoying to the Stevenses or the Taylors, right? Wrong! They were just as annoying as my neighbors who stare at me when I walk by. 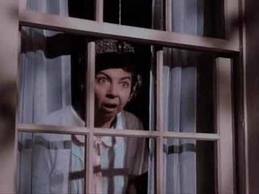 Hitchcock had it right in Rear Window, all these nosey neighbors who lead such pathetic lives that they have to be obsessed with what other people are doing and how other people are behaving should be hunted down! Or, they should fall victim to the nosey neighbor and constantly be watched and observed by their neighbors. Let the punishment fit the crime! I don’t know what I’m going to do the next time I catch them watching me as I walk by. I’ll probably stare right back, but that doesn’t seem to do anything. 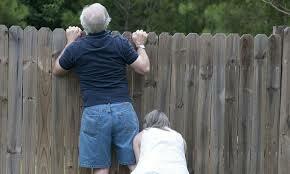 There’s really nothing you can do about a nosey neighbor except ignore them. Or, you can have a little fun and do things that seem strange and out-of-the-ordinary just to mess with them. It would be fun to see the reactions when they see something strange. Maybe next time I walk by and catch them checking me out I’ll give them a little dance move, or drop to the floor so they can’t see me from their window. I have to do something to get them to know that I’m not happy with their spying. The window on the hallway doesn’t give them the right to treat their neighbors like they’re in an aquarium! 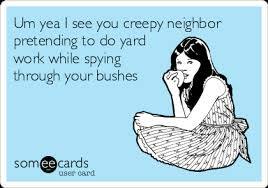 I’m no longer amused by the “nosey neighbor” character in television programs and movies. They are not lovable kooks, they are strange and weird people that have nothing better to do than watch what others are doing!